Lying is not a good thing; I think we all know that. Lying about relationships is obviously a bad idea and lying about relationships to your relations is a recipe for disaster. When Lina goes to her younger sister’s wedding, her relatives start pressurising her to marry a ‘nice boy’ and begin lining up what they consider to be suitable candidates. Lina does the worst possible thing and makes up a fiancé. Normal standard chick-lit would only require to make up a boyfriend but Lina’s life’s not quite so simple. Whilst she lives in California, her family are from Calcutta and you can’t just make up a boyfriend without your relatives thinking you’re a bit of a loose woman. Lina should have known better but it’s amazing what panic and pressure can make you do. Threatened with a visit from her Auntie Kiki who wants to come and meet the prospective groom and give her approval, Lina needs to find a fiancé and find him quickly. Finding a man shouldn’t be too hard because Lina – ever so conveniently – just happens to be a matchmaker. She claims to use a mix of mathematics and instinct, saying she sees fine silver threads stretching between matched couples. Yeah really? Give me a break please. Taking advantage of access to all the company files she’s soon out having dinner with a young doctor so tired he falls asleep over dinner, a smarmy man with a suspiciously white mark on his ring finger, and various other dodgy blokes. Telling her parents and sister that her chap is called Raja (the name of a good looking but rather too traditional hunk whom she met at her sister’s wedding), she soon has her conveniently trendy but gay friend Harry leaving his clothes and toiletries around her flat to persuade her sister that things in the love-bed are rosy. She can keep the family at bay with claims that Raja is ‘travelling’ but sooner or later she’ll have to provide them with a man to appraise. Soon the aforementioned hunk, Raja, turns up hot foot from Calcutta to ask Lina to find a bride for his brother. Lina’s attracted to Raja but not to his traditional values. He wants a stay at home wife who’ll look after his mother. But as their attempts to match his brother progress, Lina starts to see another side of Raja and you can pretty much predict most of what will follow. Both love their lives and the countries they live in but there’s no way both can have what they want. And of course sooner or later Raja’s sure to find out that Lina’s supposed to have a fiancé. If I was feeling charitable I’d describe the plot as very slightly redolent of a Shakespearean comedy with all its comedy of errors and misunderstandings. Or possibly I could draw parallels with Jane Austin’s approach to social manners and family life. There’s a little bit of Pride and Prejudice going on (but with only 3 sisters this time). But I’m not feeling charitable so I’ll tell you inside that it’s just a rather lightweight bit of chick-lit ‘pap’ that doesn’t really justify cutting down trees to make the paper. I had the plot worked out from page 26, complete with a few of the twists along the way. It really was extraordinarily predictable. The most annoying character in the book was the ‘imaginary man’ who crops up every few pages as Lina’s conscience, testing and tormenting her and challenging her ideas. It really was too silly for words. I suspect that the people who like chick lit kind of expect that sort of thing so I shouldn’t be too cruel. I don’t normally read this sort of silly romance but I will read anything (good, bad or indifferent) if it’s got an Indian ‘flavour’ to it and I’m particularly interested in inter-cultural conflict and the whole issue of people struggling to ‘fit in’ and finding their place in society. Whilst I don’t regret the short time spent on reading this one you probably won’t be surprised to hear I won’t be keeping it in my Indian collection. 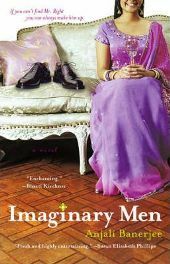 2 Comments on "Imaginary Men"
I think it depends on whether you like the genre – for me chick-lit is not something I particularly enjoy but if you do, then give it a go.